Southern Railway Company - Vignette Slogan "The Southern Serves the South"
Home > Cars, Railroads, Ships > Railroads - Company names from P - Z > Southern Railway Company - Vignette Slogan "The Southern Serves the South"
Beautifully engraved certificate from the Southern Railway Company issued in 1965-1969. 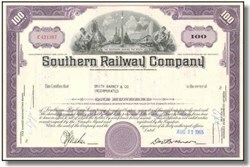 This historic document was printed by the American Banknote Company and has an ornate border around it with a vignette of two allegorical men by a railroad track with the words "The Southern Serves the South". This item has the printed signatures of the Company�s President and Secretary and is over 33 years old.